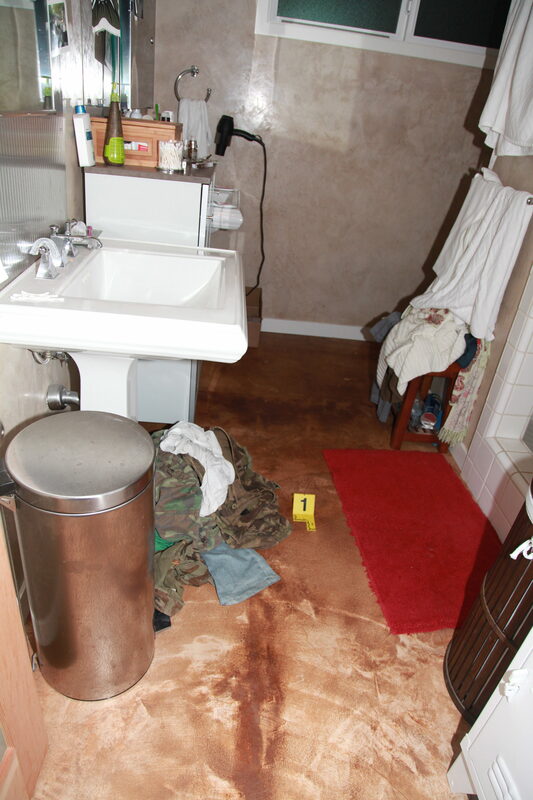 When I studied the police photos of the bathroom, I saw reddish stains covered with a brownish wash. Other investigators dismissed my perceptions as biased and wrong. I wondered: Is there a way to objectively confirm my subjective impression that the dark stains look bloody red? Is there a way to separate the two different stain colors — brownish and reddish — to make blood in the police photos more obvious? The answer is: Yes, kind of. The stains are certainly red, but are they blood? Maybe a blood-stain-pattern expert might be able to draw conclusions. As far as I know, there’s no way to definitively confirm that a photograph depicts actual blood. Owing to the blunders and forensic malpractice of the Long Beach Police Department, the bathroom was not tested chemically for the presence of blood. But the LBPD did take photos, and that’s worth something, if only to me.